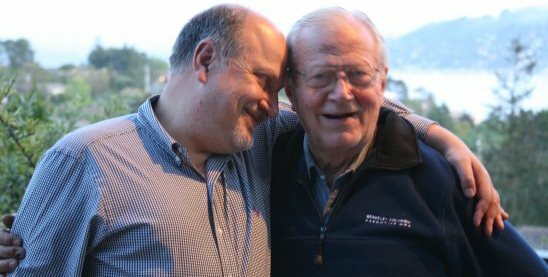 Carlos and his Father Pio Sixto in Tiburon, 2008. As I await my flight at SFO to visit my ailing dad in Argentina, I can’t help but reflect on his immigrant narrative. At a young age he immigrated to Argentina from Northern Italy. As the only son in a family of 7 children during the Great Depression, he was forced to quit school at age 10 to help his dad (my grandfather) support his family. How did my dad enter the workforce with just a third grade education? Through apprenticeships. My dad became an apprentice at a leather treatment and manufacturing company that would serve as his “trade” and source of income for the next 20 years. Extreme as this story is by modern standards (today this scenario would constitute clear child labor law violations), there is obvious silver-lining worthy of reflection. Through this apprenticeship, my dad was able to learn professional skills (leather was an important material for making saddles, car seats, sofas, and chairs before plastics rendered its almost obsolete decades later). While the apprenticeship was not part of any formal or government-sponsored internship program, enterprises of all sizes were willing to hire apprentices, initially without pay until they learned some minimum skills of the trade. Despite some egregious instances of abuse and unfairness, my dad was able to learn important job skills that served the foundation for his lifelong productive contributions to Argentina’s economy. Although apprenticeships were an important part of the U.S. and the European education system in the 19th century, they fell out of favor in the 20th century and are not offered to the vast majority of high school and college students in the 21st century. American society has for the most part decided that the proverbial lemonade stand, where children tested their abilities to successfully launch and manage a small enterprise, is a phenomenon of the past. Our society now discourages this type of behavior because of multiple fears that include numerous potential health and safety liabilities. The alternatives for children’s diversion are far more enticing. After all, it is much “safer” to sit children in front of an X-box or enable them to spend countless number of hours gossiping on Facebook than to brave the elements and start a new enterprise. Ironically, we would benefit from such apprenticeships now more than ever. Bringing back work apprenticeships for high school and college students could have a myriad of positive impacts on society while introducing a positive and disruptive reform to the education system that often emphasizes the liberal arts at the expense of math and science. A national initiative to promote the creation of work apprenticeships for high school and college students would both help to develop an early understanding between the value of work and the creation of social and economic value by immersing our youth in the workplace. This paradigm shift could lead to a significant reform in the education system, as it will include experiential learning as part of its formal curriculum. As we explore ways to launch such an initiative, we would be well-served to look at Germany, where apprenticeships are considered an essential part of a college education. Instituting such an apprenticeship program here in the U.S. would forge a new partnership between the next generation of consumers and the next generation labor pool. In turn, change agents within the educational system will adapt and integrate the apprenticeship program into their curriculum combining the experiences gained in the enterprise with those learned in the classroom. While it will clearly be difficult to change the established “order of things,” enlightened public policy could generate a sufficient number of employers enrolled in the program that eventually could form the basis of a mandatory component of high school and college curricula. The introduction of apprenticeships at the high school level is a particularly innovative aspect and provides a pathway for a lifelong career not too different from my dad’s. The mission of academic institutions must be to ensure that their students gain employable life skills. As wonderful as a liberal arts education is, it is no substitute for ensuring that all students are employable upon graduation. A national apprenticeship program would not only help to orient the goals of the education system around employable life skills, but also create new partnerships between the educational institutions and the private sector within an enlightened framework created by public institutions. The wide introduction of information and communications technologies (ICTs) would enable young workers and entrepreneurs to connect with one another within a trade or industry areas of interest and explore new global ventures as they gain the skills they will need to succeed in the 21stcentury economy. Until my next post — Carlos B.
 Apprenticeship is “a training strategy that combines supervised, structured on-the-job training with related instruction and is sponsored by employers… that have the ability to hire and train in a working environment.” See http://dwd.wisconsin.gov/dwd/publications/dws/apprenticeship/apprenticebooklet.pdf, p. 2.